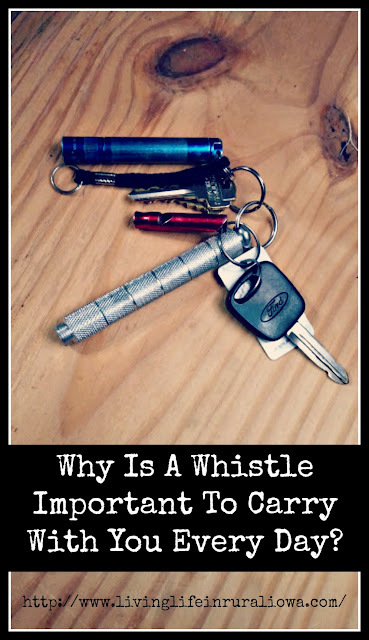 Why Is A Whistle Important To Carry With You Every Day? Many people have things they carry with them every day. Also known as everyday carry, we all have items that we carry on a key ring, in our pockets, on our belts, and/or in a holster. These are items we couldn't live without or wouldn't want to be without in case of an emergency or a situation. One of things I carry on my key ring which I carry in my jean pocket is a whistle. This is absolutely one item I wouldn't want to be without. I work in a place where we can not carry a weapon although our customers can. While this can be a problem (but never has been), a whistle can help me in a few ways. Blowing a whistle while in distress can alert co-workers that there is a problem. A loud, repeating whistle generally will get their attention or a customer's attention that I need help in some way. Whether I am inside or outside the building, I will almost guarantee to get someone's attention to get help. Yelling can work, but a whistle is usually louder and shriller and will get attention quicker. Outside of work, having a whistle on the farm is also handy. If I am in distress on the farm, I can get attention faster using a whistle. While we try to work together when we are outside, that is not always possible. Having a whistle can be used more effectively to get attention and help. Being out in public, a whistle can be your best friend if you are in distress or being attacked. When you are in distress or being attacked, the best thing you can do is blow that whistle if you do not have another way to defend yourself. Even if you can defend yourself, blowing a whistle can still get you help faster. Having a whistle can also help you get help for someone else. If you are near someone who is hurt and you don't feel comfortable or safe to leave them, you can blow the whistle for help. If you see someone in danger or being attacked, you can blow the whistle foe help before you try to help the endangered person(s). Having a whistle is not a replacement for defending yourself. It is a way to bring attention to yourself if you need help. While I would still defend myself or others with all that I have and can, having a whistle can definitely be a life-saving measure. That is why a whistle has a permanent spot in my every day carry items. What else should you carry in your every day carry? Let the other Prepared Bloggers tell you! Everyday carry, or EDC for short, refers to items that are carried on a regular basis to help you deal with the normal everyday needs of modern western society and possible emergency situations. Some of the most common EDC items are knives, flashlights, multitools, wallets, smartphones, notebooks, and pens. Because people are different, the type and quantity of items will vary widely. If you have far to travel for work or have young children, your EDC could be huge! But, even if you're just setting out for a walk around the neighborhood, taking your essential items with you in a pair of cargo pants with large pockets, may be all you need to be prepared. LeAnn at Homestead Dreamer won't be caught without her handy water filter. Todd at Ed That Matters tells us about the one item you'll always go back for...your cell phone. Angela at Food Storage and Survival loves her Mini MultiTool, it's gotten her out of a few scrapes! Please check out everyone listed! They all have great advice!